As in "fight for the prize". 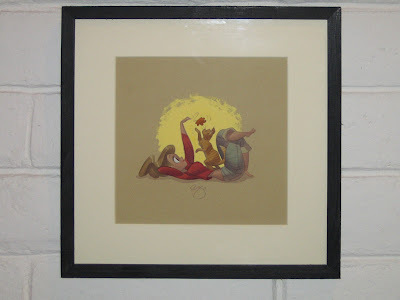 The prize being this piece below (when it's done that is). 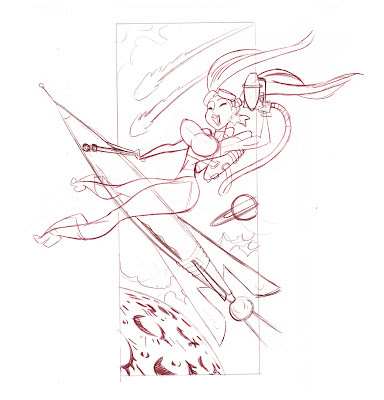 Draw or paint your personal interpretation of a "Pin-up Girl" to win. To enter, see my previous post and the Chiustream for details. I'll post more of "the prize" as it progresses. Bobby Chiu will be interviewing me on his Chiustream this approaching Thursday night. 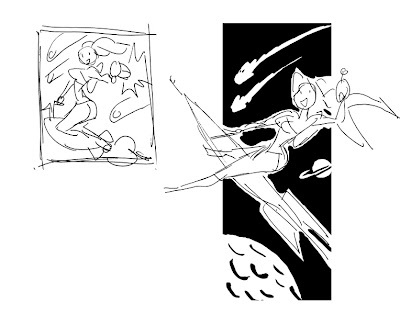 Chiustream is a live streaming video by artist/teacher/entrepreneur Bobby Chiu. When not interviewing fellow artists (on the Chiustream) Bobby does live painting demos and answers questions through chat. Very inspiring, check it out. Opening Reception is 7:00- 11:00 p.m. I know they're at the same time. I'd love to go to both but since I live in the bay area it'll just be Purrcaso for me. A Gruau inspired piece I finished recently for the Gallery Nucleus QUINQUENNIUM EXHIBITUM: NUCLEUS 5 YEAR ANNIVERSARY EXHIBITION. November 7, 2009 - November 30, 2009. Just around the corner! APE was a blast this year. Better than last in my opinion, but who am I to say? 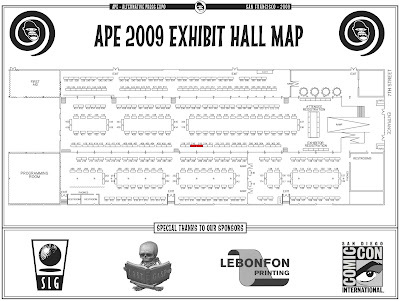 I will be attending APE this weekend. Splitting space with Scott Morse as usual, tables 315 and 316. I've finally received a supply of my new book from Fluide Glamour! They're imported from France and I've only a limited amount of them, so I'll be selling half at APE and saving the other half for CTN. 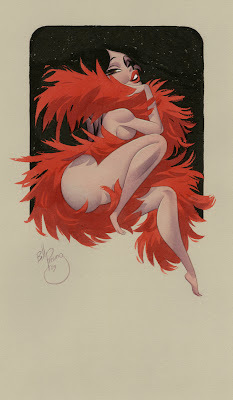 I've also got a new print to sell, my recent Flying Tiger piece. I finished my Purrcasso piece early for once! This original piece of art will go up for auction November 7th and/or 8th to help raise funds for needy animals. See the official Purrcasso website for show details as they develop. I realized I haven't posted any new art in a while. I've been working on some stuff lately that I can't show yet. 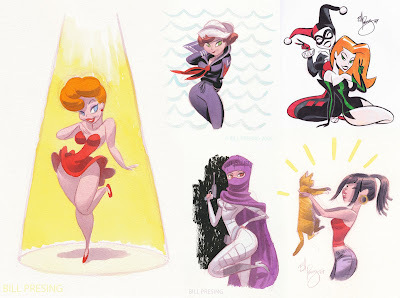 In the meantime here are a few color studies for some of my more recent pieces. Howdy folks. I looks like I'll be attending the first ever CTN Animation Expo. Mark your calendars. 10% off admission with code: PRESINGX09 (see below for details). 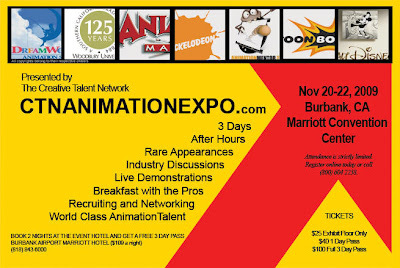 Have you registered for the Creative Talent Network’s Animation Expo (CTN-X)? Early bird pricing ends September 30th. The most anticipated animation tradeshow on the planet comes to the City of Burbank beginning Friday, November 20th – Sunday, November 22nd. This is the ONLY place where you’ll meet so many animation industry icons under one roof. Make contacts, learn new techniques and meet with recruiters. Hurry and join in on the action where “X” marks the spot to connect with renowned artists from around the world. Register online or call today (800) 604-2238. CTN-X takes place at the Burbank Marriott Convention Center with ample discounted parking and is conveniently located across the street from the Burbank Airport and Amtrak Station. Early bird tickets are $25 for the exhibit floor only, $50 for a day pass and $125 for a 3-day pass. Discounted rates are available to students, active military and professional industry organizations. Space is strictly limited at this groundbreaking event. 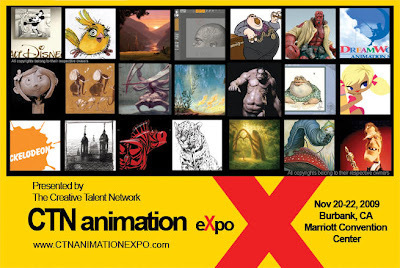 For more information and to register, please visit: www.ctnanimationexpo.com or call, (800) 604-2238 and mention the special member discount code to obtain an extra 10% off any 1day or 3day professional/general passport. My wife and I received some awesome wedding gifts, but this one from Kei Acedera takes the cake. Or "dessert" may be more appropriate. Based on this piece I painted as a Valentine gift for my wife. Hand sculpted (with sculpey I believe) by the ridiculously talented Kei, who has bravely ventured into the realm of three dimensional pin up. A place I have not yet dared to tread. I'm awed, inspired and jealous even. It makes me want to mass produce this cutie. Once again an enormous thank you from us both to Kei. Wow. Every year I contribute an original piece of art to the Berkeley-East Bay Humane Society's art show fundraiser Purrcasso. It's that time of year again and they're going to need contributions. If you're an artist who would like to donate a cat or dog themed piece of art, check out the official website for details. 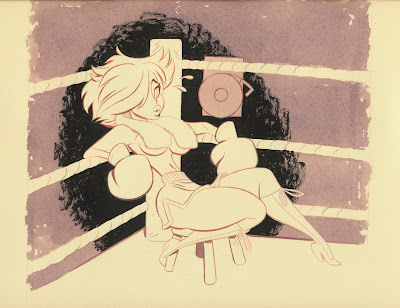 The show itself will be held November 7th and 8th (location still to be determined), so if you're an art collector who enjoys the work of animation artists you may want to check it out. All of the money raised will go to the animals in the Berkeley Animal shelter and for their care. You can check out my contributions from the previous two years HERE and HERE. Some of you may remember a few years back an animated short made by Alex Woo and myself (mostly Alex, and also Matt Peters and a bunch of other people). 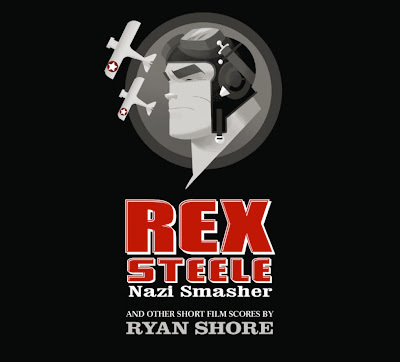 Rex Steele: Nazi Smasher, based on the comic of the same name. Well let me tell you, it's got one heck of a rousing musical score composed and conducted by a certain Mr. Ryan Shore, and performed by the Czech Philharmonic Orchestra no less. I'm very proud to announce the Rex Steele score along with other short film scores by Ryan Shore is now commercially available on CD or MP3 download. Sound clips and more info HERE. CD distributed by Screen Archives Entertainment. Download album in 320kbit mp3 format HERE. Download album on iTunes HERE. My cartoon airplane drawing hero Jean Barbaud is putting together a new book about sharkmouth airplanes. I was so honored that he asked me to contribute a sketch, my enthusiasm soon brought it to a full finish. Thanks for the opportunity Jean! I find airplanes particularly difficult to draw. 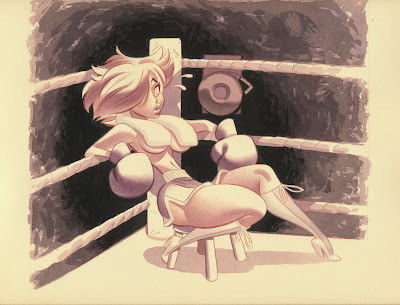 I'm always amazed by the ease Jean draws them with, and especially his ability to caricature them. If you've never seen his stuff definitely check out his blog. 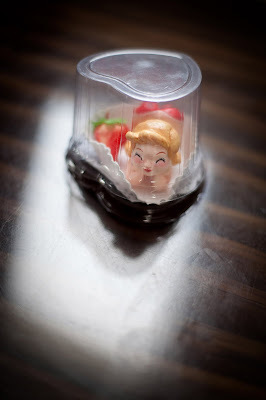 A little thank you gift for our insanely awesome rockstar wedding photographer Fer Juaristi. Married that is. 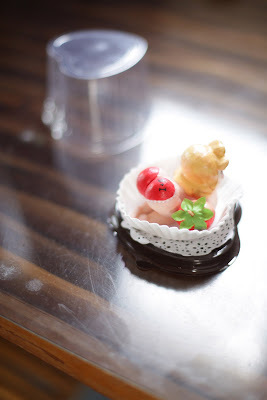 To my amazing fiancée Ikumi! We tied the knot a few weeks ago in Mexico actually, and have been on extended vacation since. Extraordinary thanks to all of our friends and family who attended. 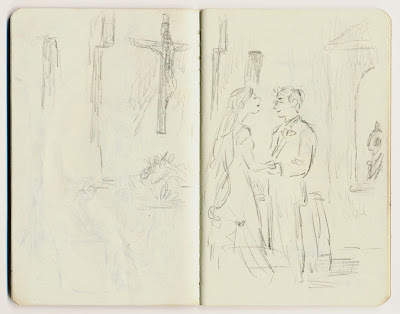 Specifically extra thanks to my good friends Sarah Birns-Blank and Dan Blank for masterminding this little moleskin archive of our wedding which everyone contributed to. In particular this page of the all important moment as witnessed by my talented chum Nick Sung. Thanks to him and everyone else, I love you all. Graphic Collectibles however will be there selling these two original pieces of art of mine. These are the originals, not prints. They'll be at booths 500 - 504. I finally got my copy of the Art of UP book. A little late I know. 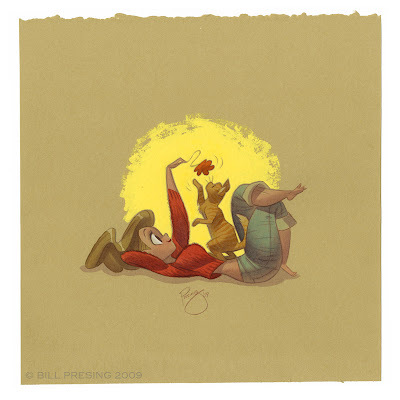 I usually don't like to mix my work at Pixar with my personal work here on the blog, but I'm very proud to have some art in the book. I loved working on this film and this book is a great memento for me, plus it's a chance for you to get a glimpse of my regular storyboard work. Now if only they'd spell my name right. Action Figure Freddy is very soon to release (if not already) this second exclusive limited print out of a series of three. Again limited to thirty copies. 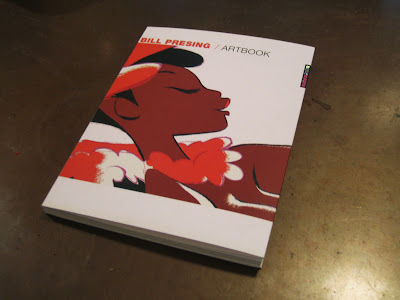 I just got my first copy of my new French published artbook. I think it looks really great, Fluide Glacial did an amazing job with it. I even got a really awesome quote from Arthur De Pins on the back. The book is essentially a new edition of the out of print Belle du Jour but the art is arranged in all new page layouts. It looks pretty slick. A new piece I'm currently working on. Time being as it is I'm not as far along as I'd like, so I thought maybe I'd post it part way through for a change. In the end the vase will obscure her silhouette much more. Action Figure Freddy in San Francisco debuted another exclusive limited print of mine. Thirty only. Get 'em while they're hot! 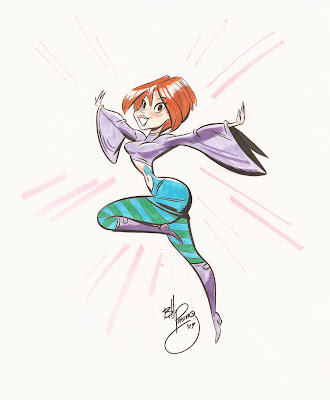 A few of the commissions I did at Super-Con this past weekend. I was doing strict B&W except this one handed me some color markers. And here's a couple more late additions. 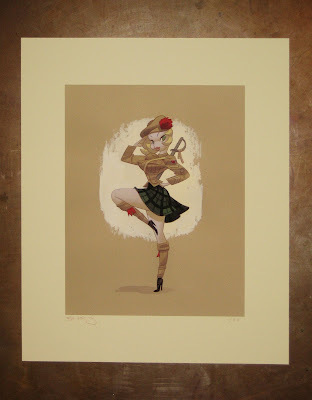 I've produced this new print of my Lance-Corporal piece that I did recently. It's a limited print which is a first time for me (I usually do open prints). There will only be 30 of them made. They'll be sold exclusively by Action Figure Freddy in San Francisco. I'm guessing they'll go on sale this week sometime. 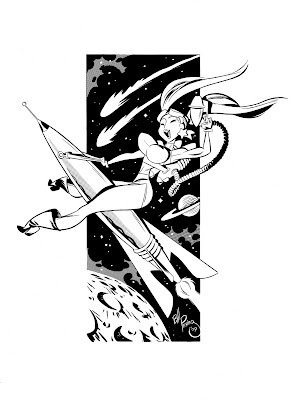 AFF also sells my other prints and Bookplate Betties, so if you're in the hood and want to pick'em up that's a good place to do it. 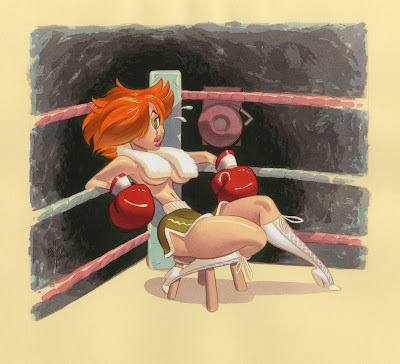 Next weekend Gallery Nucleus opens a Street Fighter tribute group art exhibition. This gave me a great opportunity to get this Chun-li piece out of my system. Chun-li was always my favorite Street Fighter character, as a young man I spent many an afternoon daydreaming of those thighs spinning through the air. Sigh. 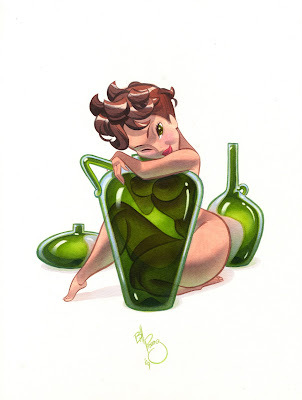 Anyway, the original art will be available for purchase at Gallery Nucleus April 25, 2009 - May 11, 2009. Here are a few highlights from the progression. There's a little extra "volume" in this piece I know. 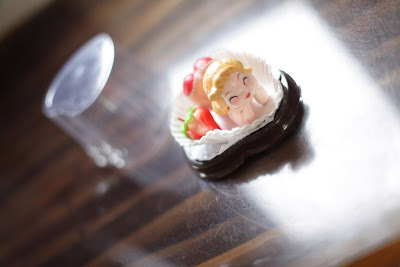 It's a gift for a couple friends... friends who are a couple. You know what I mean. There are two of them. Friends I mean. Anyway she's their creation HyperJen. 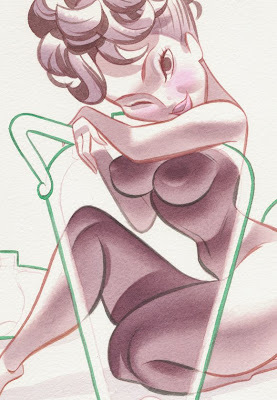 I was going for more of a retro 50's version of the character. I couldn't decide which version of the scan to post, so you get both! I like the crispness of the high contrast scan but I also like the cool variations in materials that you can see in the color scan. Including the zip-a-tone on the space stuff and rocket. Inking is fun. I need to get back into it more.